Or just regular pumpkins…or any winter squash. Ok, then. We had the parsley pesto pasta. But I like squash and we manage to get a lot of it. A few years ago, I shared some seeds for an heirloom variety of butternut squash with my mother. She shared it with my sister out in rural Iowa who still has volunteers coming up every year, even though she stopped planting them. She said she had over 50 squash volunteer this year. She’s feeding them to her chickens, and oh my goodness, are those yolks orange!. I frequently substitute pumpkin for squash and vice-versa. Last week, I made a Pumpkin-Leek Soup (click here for the recipe) from Real Simple October 2007. I used some turkey stock that had been in the freezer and it made the soup really strong, but the texture was good. You could also substitute vegetable stock if you want a vegetarian soup. 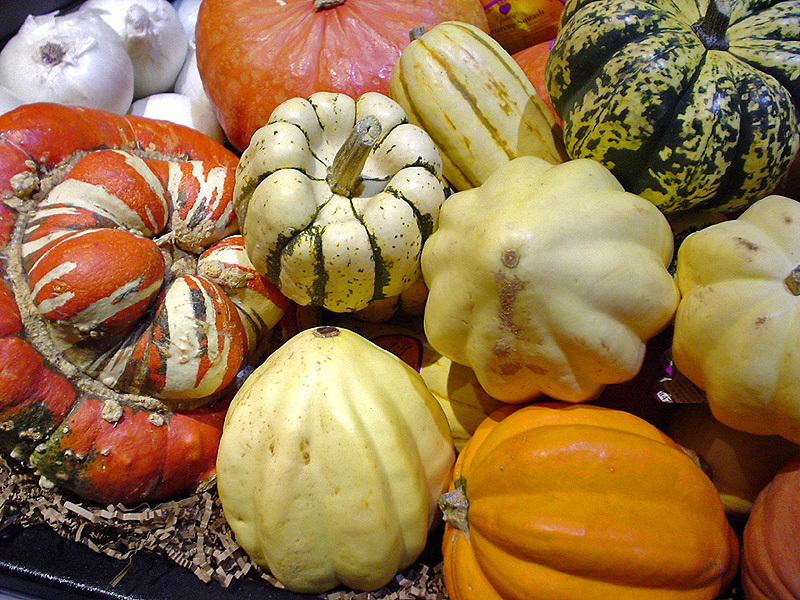 What do you like to do with winter squash? I just finished cooking my way through my CSA squashes. When I first started, the thought of squash soup wasn’t that appealing but I’ve learned squashes I love, and different techniques for many of them. Delicatas are my favorite roasted with a bit of chili powder; I love any squash puree with black beans. Overall I learned that squashes have an incredibly satisfying stomach warming property unlike any other vegetable I’ve ever tried.